R52 MINI Cooper NON S cold air intakes and intake accessories. 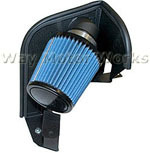 WMW has the cold air intake kits or just high flow air filters for your MINI Cooper. These are manufactured by DDMworks, K&N, aFe, and ITG.